Steven Winter grew up in Norwich and has now been a professional baker for 13 years. He was still at school when he started working in a bakery as a “Saturday boy.” He was then offered an apprenticeship at college when he left school, and has been baking ever since. 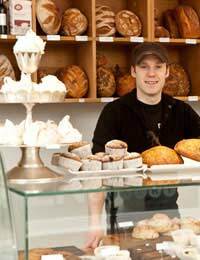 Steve has worked in a whole range of bakeries, from large scale operations to small village bakeries - and even 100 year-old, wood-fired bakeries. Q: What kind of bakery do you run yourself? A: I own and run an artisan bakery with my wife Hannah. It is called Dozen Artisan Bakery and produces hand crafted breads using organic flour and no chemicals, as well as cakes and pastries. Q: Have you built up a reputation for any product in particular? A: Yes, we specialise in sourdough bread and fine pastry. We make all of our breads with no added sugar or fats, the pastry and cake are all produced daily using only the finest ingredients. Q: How easy is it to bake bread without sugar? A: In my opinion bread should never contain sugar, unless it is a sweet bread like a brioche. Putting sugar into bread makes the yeast lazy as the yeast feeds off the sugar instead of the natural sugars found in flour – which means that you end up creating a much less flavoursome loaf. All you need is to allow more rising time. Q: what about baking cakes – that must be harder? A: Cakes made with a high percentage of natural sugars in will contain as much sweetness as they need. There are lots of great recipes out there to try, which are just as easy to follow as a recipe that does contain sugar. Q: Do you make any sugar-free products yourself? A: All of our bread is made without sugar. Even our sourdough fruit loaf just uses the sweetness from the fruits that we add. Our customers do not believe this when we tell them! Q: Could you let us have one of your sugar free recipes? A: Yes, this is a recipe for some delicious sugar free cookies. They will keep in an airtight container for about five days after baking. It does not require any added sugar at all. The sweetness comes from the fruit. Begin by preheating your oven to 175 deg C/ 350 deg F/ gas mark four. Then grease your biscuit trays. Take a bowl and in it beat your butter with your egg. Add the orange zest and gradually stir in your dry ingredients - wholemeal flour, baking powder and salt. In a separate bowl, combine the coconut, figs, raisins and pecans, and stir the mixture into the cookie dough. Divide your dough into two large pieces and roll into equal logs. Wrap them in film wrap, and refrigerate until firm. Slice cookies into rounds about 6mm thick with a sharp knife. Place on a greased baking tray and bake in the oven for 10 to 12 minutes. Remove the tray from the oven and cool on wire rack. If there are any remaining cookies, store them in an airtight container.